The Itty Bitty Kitty Committee: Happy New Year! Wishing you all a happy, healthy, bright and prosperous 2014! The girls are beautiful in black and white! So vintage looking. Happy New Year! Wylla and Charlene you both look beautiful in your black and white photos, very regal. Happy New Year! May 2014 bring you lots of joy. We didn't host a Christmas party - so no pics to share.beyond the ones of the girls in front of the tree. Happy New Year, Wylla, Bean, and human slaves! May this year be fabulous, fabulous, fabulous for you all. I'm looking forward to meeting the IBKC. Any idea when you might start fostering again, Laurie? 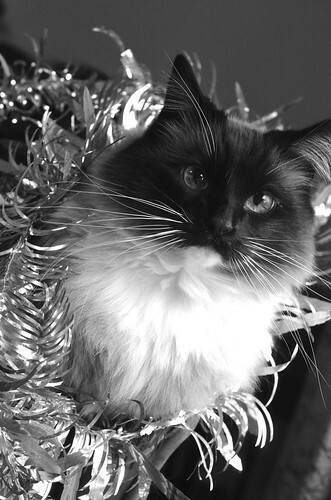 Gorgeous photos and gracious wishes from some of our favorite people and felines! Many thanks, Laurie. We wish health, happiness, and joy in the little things to you and your lovely family! Thanks for starting our year off right! The photos are very glam. 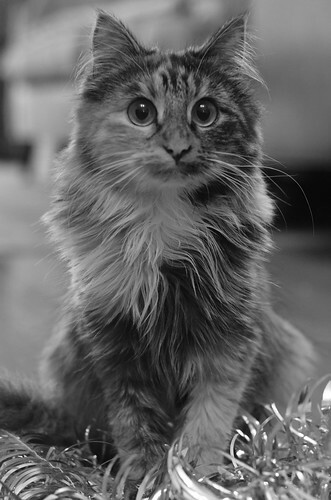 Happy Mew Year to all! Those two girls are just beautiful, whatever the colour :), and they come out very nicely in black and white here! Have a very Happy New Year, Laurie, Craig, Charlene and Wylla, all the best wishes to you! And please, keep bringing us a lot of smiles on our faces, as you so well do! thank you for making my day every day this past year. looking forward to the girls and new out and about adventures in 2014. Happy New Year to you, Laurie, Craig, Charlene and Wylla. I hope you all have an absolutely wonderful, happy and healthy 2014. Thank you for all the kitty love you share with the world.